as my wife calls her. Bike as seen on TradeMe .co.nz in April 2010. Bought without seeing or hearing it go. The bike was collected from Christchurch and delivered to Havelock by Biketranz Ltd Ph 04 2985469 A very reliable firm to deal with . I would be the fifth owner (including traders) since it was registered in Japan in 1983. 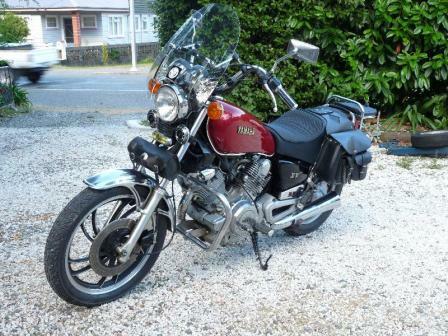 The next Registration is Barrington which I find is in Christchurch on the 21/04/994 (possibly a dealer) so at this point of time the bike has 6,000 on the clock Then it was sold on the 10/05/1995. The next registration was 19/09/1996 with 6,567 KLMs. Then it was registered to a guy from Geraldine on the 07/04/1999 with 13681 KLMs as of 12/98. Then it was registered to and bought by a chap in Shirley Christchurch with 16,500 KLMs on the clock for the price of $1700. Due to illness he had it garaged for the last 4 years. Then I saw it on Trade Me and without hearing it or seeing it decided it would be a good project to restore. It had 20,741 KLMs and I paid a fair price and had it transported up to Havelock. Because it had sat for so long I needed to replace all rubber seals and engine seals. I hold most of the original papers and this is a reasonable description of it's history. I have had as much fun restoring the bike as I have riding it. 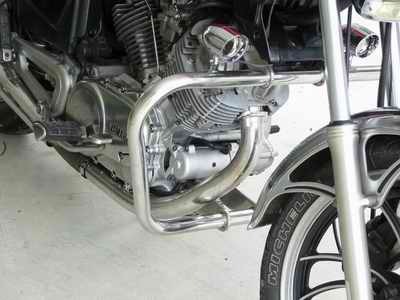 This year 2012 I hope to redo the chrome on the front guard and pipe and have the side stand chromed. Have purchased chrome edging for bottom of fuel tank. The bike after it had the roll bar fitted with 2 small spot lights.New engine seals and o rings fitted and carburettors cleaned and set. I fitted a yoke for the Garmin GPS and a cigarette lighter to run it off. The small spot lights on the roll bar is more for looks than practicality These were expensive items as wiring cost as much as the lights as they are on a separate switch and fuse. I then bought a chrome carry rack and carry bin. Saddle bags and chrome hand grips are now fitted and the bike now looks complete. 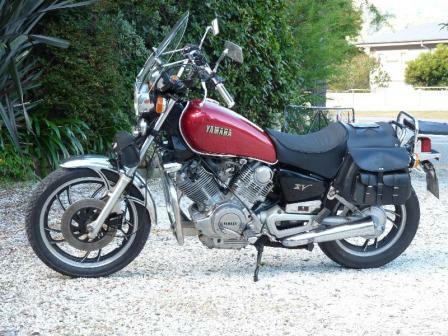 I am yet to purchase a round tool bag to hang on the front and then I will look at getting a new front tyre with The new emblems cost around $50 each and the tank cost $250 to paint. The chrome work on the bike is in reasonable order as the bike was garaged in doors since 2004.After buying the necessary pants and jacket & gloves/boots I decided to join the Marlborough Ulysses Club. The current speedo reading as of the 06/01/11 is 21648 klms. 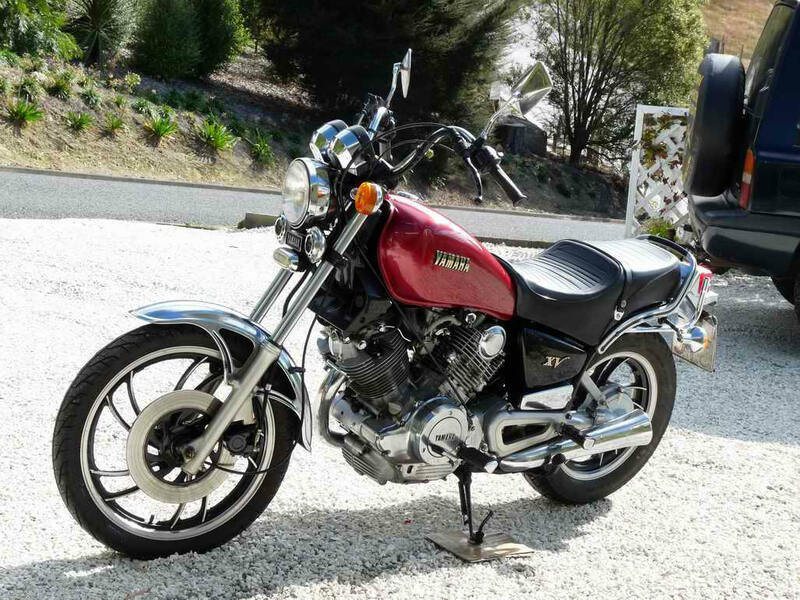 and my asking price with all the extras would be $7500 as I think this bike is in a class of it's own and would be one of the best examples about. A real collectors item. The seat is still in it's original condition but as an upholsterer I am hoping to recover it when it starts to look shabby. The new saddle bags costing $191. Fitted in January2011 The finished look with new wind shield, saddle bags and chrome hand grips. Just had the silver trim added to the edge of the fuel tank. Bought the trim through Ebays from the USA. Am now considering having the mag. wheels powder coated in gold. Rear suspension= Yamaha Monoshock,1 Kayaba damper,4.2 in. wheel travel, adjustments for air pressure & rebound damping. Fuel consumption= 42 to51 mpg 47.7 mpg avg. April 31st 2012 speedometer repaired at a cost of $121.90 by E Parrott & Son of Christchurch and new cables purchased at Auto care of Blenheim. Also new throttle cable and clutch cable. April 2013 fit new front caliper kit seal kit ( cost $69.21) bought from Motocare Ltd Blenheim. Ordered in January spare master cylinder through E-bays for chrome plating arrived April and sent to chrome platters ( cost $75 US) ordered brake pads for front ( cost $30.85 US ) also ordered Master cylinder rebuild kit $34.13 US) and new sight glass Repair from www.newrivercyclesalvage.com at a cost of $15 US. shall fit after unit is chromed. Got Bike W.O.F in Mid April ($34.50) and registered. Registration cost ($528.41) for the year. AA bike insurance cost ($226.93) Been a hard month. Just need to replace back tyre for the winter. November 2013 bought new Starter Motor off Ebays $194.01 NZ and on fitting discover that a Cam Guide Stopper was broken so a replacement was ordered from Partzilla.com at a cost of $107.15NZ A full gasket set ordered from Hall's of Medford at a cost of $85.06 NZ and to top it off and make it complete I bought a new starter cog from Boats.Net for $175.89 NZ Hopefully my friend and I will have it up and running by the end of November. Also bought a new crash helmet off AliExpress.com for $63NZ delivered to the door. In some cases the delivery cost was greater than the parts.